Travel day – Part 1 in the U.S. I am in Atlanta sitting on the plane bound for Mexico City. My flight from Cincinnati to Atlanta was delayed 23 minutes which had me a bit worried as my layover was already a very short 59 minutes. Fortunately, we made up the time in the air and I got to my gate right as they called my seating zone to board. I even had time for a restroom stop. Thank goodness! The flight to Mexico City from Atlanta is only 2 hours and 54 minutes. Many people thing that Mexico City is really far from where we live, but it actually takes less time to get to the DF (Distrito Federal as it is called in Mexico) than it does to get to the west coast of the U.S. In fact, I might actually arrive in the DF before my kids back in Mason, Ohio change out of their pjs. 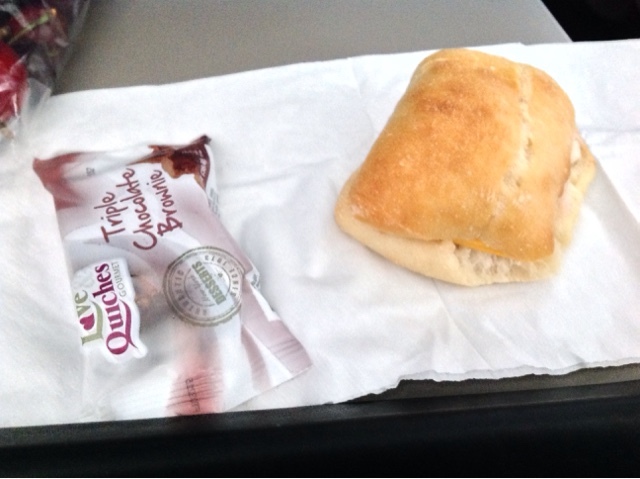 I ate a little breakfast at the Cincinnati airport Starbucks (yummy feta spinach wrap with cherries and black coffee) before I got on my first flight this morning, but I’m starting to get hungry again so I unpacked some cheesesticks, more cherries and water. 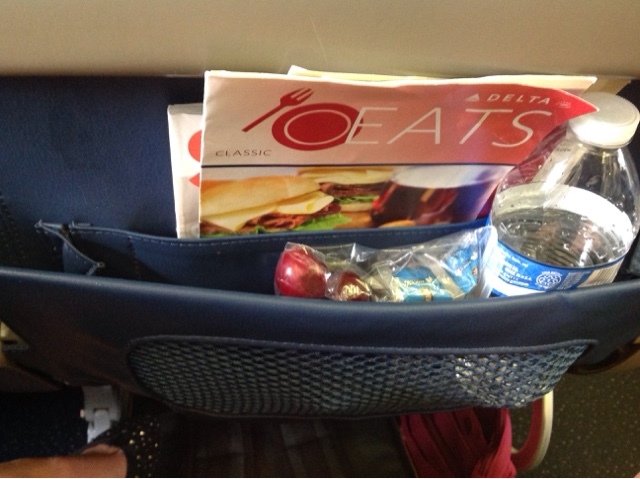 I will also have this little Delta sandwich on the flight since I really have no idea when I will eat again. I don’t want to eat anything big at this point because I want my next culinary experiences to be in Mexico. While sitting on the runway, I am hearing so much Spanish around me. Some are speaking so quickly I can barely understand what they are saying. I used to understand everything. Now, I don’t have the chance to speak with native Spanish speakers regularly so my speaking and listening skills are rusty. That is what prompted me to apply for the scholarship to take this trip. This is a work trip for me. I’m doing this to make me a better Spanish teacher. I think it will take me a few days to be comfortable in the immersive environment, but I know from past experience that it will happen. My Spanish skills are rusty, but not gone. They have been dormant. It might sound strange to some people that a Spanish teacher in a really good, progressive school district admits that her Spanish skills are not perfect. Like any skill, profession or subject area of teaching, regular study and professional development are needed to stay current in the field. It is my hope that this experience reignites my love of Spanish, my enchantment with the people and culture of Mexico and my passion for sharing these things with my students. Oh yeah, I also hope it shows my biological kids that adults are always learning and growing just like they are. To be the best mom I can be, I need time to change and develop as a teacher and as a mom. Time away from each other will be challenging, but my kids and husband know how important it was for me to grab this once in a lifetime opportunity. They know that being a mom will always be first for me. Now they are getting a chance to see their mom differently. This is a new mom with personal and professional goals and lots of wanderlust in her blood. Their support of this adventure means literally means the world to me!